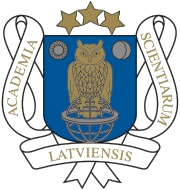 The Latvian Academy of Sciences (Latvian: Latvijas Zinātņu akadēmija) is the official science academy of Latvia and is an association of the country's foremost scientists. The academy was founded as the Latvian SSR Academy of Sciences (Latvian: Latvijas PSR Zinātņu akadēmija). It is located in Riga. The current President of the academy is Ojārs Spārītis. The Academy of Sciences edifice was built after World War II, between 1951 and 1961, collecting the necessary financing from the newly established kolkhozes in Latvia and – as further expenses increased, collecting the finances as "voluntary donations" deducted from the salaries of the Latvian rural population. The building is decorated with several hammer and sickle symbols as well as Latvian folk ornaments and motifs. The spire was originally decorated with a wreath and a five pointed star, which was removed after Latvia regained independence in 1991. Being 108 metres (354 ft) tall, it was the first skyscraper in the republic and was the tallest building until the construction of the Swedbank Headquarters in Latvia (121 metres, 397 ft), and at the time, one of the highest reinforced concrete buildings in the world. The building, designed by Osvalds Tīlmanis, Vaidelotis Apsītis, and Kārlis Plūksne, is a cousin to similar Stalin-era skyscrapers, which were representative of what became known as Stalinist architecture (sometimes referred to as Socialist Classicism). The architecture of the skyscraper resembles many others built in the Soviet Union at the time, most notably the main building of Moscow State University. Local nicknames include Stalin's birthday cake and the Kremlin. The view of Riga cityscape is open for public viewing from the 17th-floor balcony (height of 65 metres, 213 ft). The tower is located in the suburb of Maskavas Vorstadt. This page was last edited on 20 April 2019, at 20:08 (UTC).